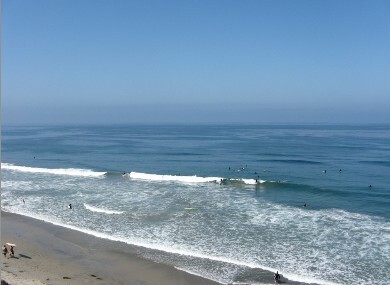 Join the surfers at Grandview Beach Encinitas. 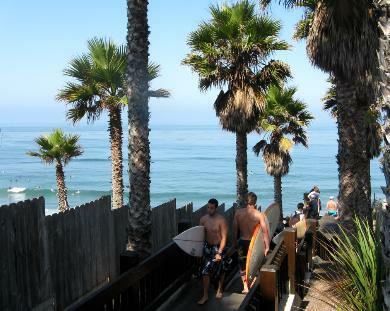 This local beach is a popular beach access to Leucadia State beach, in north San Diego county city of Encinitas. The views are nice, the surfing is good. I'm always surprised that Grandview Beach is left off of some of the list of beaches in north San Diego county. It has better parking and better access than Beacons beach to the south. Both are actually beach access points to the same long beach at the bottom of the cliff - Leucadia State Beach, which stretches from Moonlight Beach in Encinitas to South Ponto beach in Carlsbad. This is a nice section of San Diego beaches, and is popular for walking and jogging, as the beaches can stretch on for miles at low tide. Mostly, this beach access is used by surfers. Parking: Nice sized parking lot at the end of Neptune Avenue. Additional street parking available. Getting There: Short walk down a set of wooden stairs to the beach. Stop and enjoy the grand view! Things to Do: Surfing, walking, jogging, sunbathing, swimming, body boarding. Facilities: None. 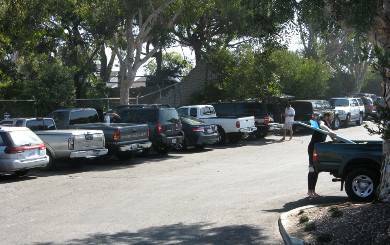 Restrooms are ½ mile walk north to South Ponto Beach, or 1 mile south at Moonlight beach. Dogs: No dogs allowed on the beach. Disability Access: No disabled access. This is a steep wooden staircase to the beach. Directions - From Interstate 5 in Encinitas, take Leucadia Blvd. west to 101, then continue on W. Leucadia Blvd to Neptune Avenue. Turn right on Neptune, which is a one way street. Go past Beacons beach to the dead end. On the right is a parking lot. If full, find parking along Neptune Ave. A steep set of wooden steps along the bluff leads down to the beach below.